Elk are awesome, the most majestic of the deer species, and in my opinion the most exciting and challenging hunt you can go on. If you have ever heard an elk bugle you know what I’m talking about and if you haven’t your missing out. In our area we have elk in the 260”-350” class and are restricted to 3 or 6 points or larger depending on zones to increase the age structure of our ever expanding herds. 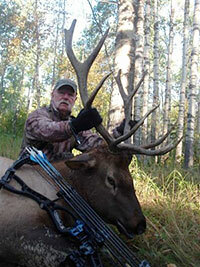 Elk hunts are conducted using tree stands, stalking and calling during rut. “NEW JET BOAT HUNT NOW AVAILABLE”. Bow hunts run from late August through Oct.
Rifle (or any weapon) run from late September through November.